Hot and dry this Christmas and New Year, which has been fabulous for visitors and locals alike. No mozzies, no mould and no muddy feet - very nice! 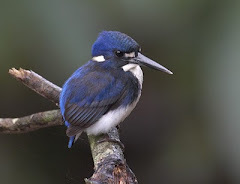 We are busy renovating at the moment - (see our blog for that h ttp://redmillhouserenos.blogspot.com.au/ ) so between that and having guests in, there hasn't been much time for birding. A quick trip out onto the Daintree River late afternoon on New Years Eve reminded us of how wonderful the river is. Magpie Geese line the banks along the farmland section, herons (Great-billed, Nankeen Night and Striated) feed in the shallows along with three types of egrets, Royal Spoonbill and two types of ibis. Double-eyed Fig-Parrot, Wompoo Fruit-Dove enjoying the fruits and Azure Kingfisher in the mangroves. 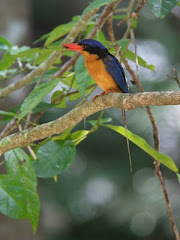 Great news from Bushy Creek in Julatten with Yellow-billed Kingfisher being photographed at Christmas. Papuan Frogmouth chicks seem to have all fledged successfully along the Daintree River and many birds are feeding young in the garden at Red Mill House. Will there be a wet season this year? We are all wondering. Great weather for building projects though!